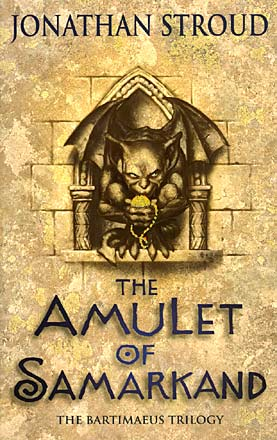 The Amulet of Samarkand by Jonathan Stroud is a fantasy story about a young boy, Nathaniel, and his Djinni, Bartimaeus. Nathaniel is an apprentice magician in modern-day London to the incompetent master, Arthur Underwood. Nathaniel slowly learns useless facts about magic until one day, another magician, Simon Lovelace, visits the Underwood home and, without any protest from Arthur, verbally and physically humiliates Nathaniel. He vows to get revenge on Lovelace and secretly studies powerful magic in Underwood’s library. To help him get revenge, Nathaniel successfully summons a powerful and mischievous Djinni named Bartimaeus. Bartimaeus is sent to steal the Amulet of Samarkand, Lovelace’s most prized artifact, as revenge. Once the amulet is retrieved, Nathaniel hides the amulet in his master’s study. Eventually, Lovelace steals his amulet back, and in the process, he burns down the entire Underwood home, killing Arthur and his wife. Nathaniel and Bartimaeus try to steal the Amulet again, but they have unknowingly walked into the center of a corrupt scheme, they discover that the amulet is a part of a huge conspiracy run by Lovelace involving murder, corrupt magicians, and a coup. Nathaniel and Bartimaeus must act quickly to uncover Lovelace’s plot and reveal Lovelace’s plan to the public. When I began to read the story, I noticed there was always action, from the first page to the back of the book. The first few chapters were a bit confusing since there was little to no setup, but the footnotes at the bottom of the pages helped me understand most of what was happening. The book also switches the point of view between Nathaniel and Bartimaeus every few chapters like Rick Riordan’s books. I would recommend this book for advanced readers aged eleven or twelve, or average readers thirteen and fourteen. The Amulet of Samarkand contains a hint of British english which introduces new words usually only used in Britain. The constant action keeps the readers attention and made me want to read more and more. I would give this book 6 out of 10 stars since it is an action packed page-turner but has a fast and weak plot.